We pulled away from the dock, the rhythmic squak of Aboriginies ringing through the outdoor speakers...the Survivor theme played. Between the time when we boarded the docked boat until we shoved off, each castaway had inbibed a few, and we awaited the time at which the State Dock authorities would turn the massive ship over to our inebriated captain. JJ took control, and we were on our own. Each night we seemed to find the perfect space to tie off for the night. We drank, we ate, we swam...we drank. We built fires on the beach and ran the Kentucky "naked-gauntlet" through some of the country's finest red-necks, the only thing keeping us awake was the 3 cases of Red Bull we knocked down in the first 36 hours. 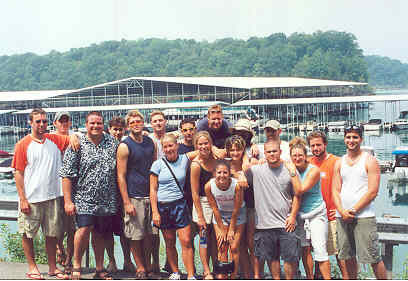 We returned to shore on Monday, 7/23/01, everyone still alive...and still smiling. Nobody died, a few puked, and fewer 'forniced'. In the end, it was a near-perfect trip, with near-perfect company. Are You Ready For Some...Alcohol?